Laundry Lint Pollutes the World’s Oceans – ScienceNOW. There’s nothing subtle about dryer lint: Clean the fluffy, gray mat off the filter or risk a fire. Washer lint, however, is sneaky. Nearly 2000 polyester fibers can float away, unseen, from a single fleece sweater in one wash cycle, a new study reports. That synthetic lint likely makes its way through sewage treatment systems and into oceans around the world. The consequences of this widespread pollution are still hazy, but environmental scientists say the microscopic plastic fibers have the potential to harm marine life. The existence of so-called microplastics in marine environments is not, in itself, a revelation. Larger bits of plastic, such as those in the infamous Great Pacific Garbage Patch, gradually break down into microscopic fragments. And minute plastic fibers have turned up before in treated sewage and on beaches. But no one had looked at the issue on a global scale, says ecologist Mark Browne of University College Dublin. So Browne and his team recruited far-flung colleagues on six continents to scoop sand from 18 beaches. (The scientists had to wear all natural-fiber clothing, lest their own garments shed lint into the samples.) Back in the lab, the researchers painstakingly separated the plastic from the sand—a process that involved, among other things, hand plucking microscopic fibers from filter papers. A chemical analysis showed that nearly 80% of those filaments were made of polyester or acrylic, compounds common in textiles. Not a single beach was free of the colorful synthetic lint. Each cup (250 milliliters) of sand contained at least two fibers and as many as 31. The most contaminated samples came from areas with the highest human population density, suggesting that cities were an important source of the lint. Cities come with sewers, and Browne’s team thought the plastic fibers might enter the ocean via sewage. Sure enough, synthetic lint was relatively common in both treated wastewater and in ocean sediments from sites where sewage sludge had been dumped. In all the samples, the fibers were mainly polyester and acrylic, just like the ones from the beaches. Finally, the researchers wanted to see how synthetic lint got into sewage in the first place. Given its polyester-acrylic composition, they thought clothing and blankets were a good bet. So they purchased a pile of polyester blankets, fleeces, and shirts and commandeered three volunteers’ home washing machines for several months. They collected the wastewater from the machines and filtered it to recover the lint. Each polyester item shed hundreds of fibers per washing, the team reports in the 1 November issue of Environmental Science and Technology. A polyester sweater may seem cozy and innocent on a winter day, but its disintegrated fibers could be bad news in marine environments, Browne says. Other studies have found that microplastics in the ocean absorb pollutants such as DDT. And Browne’s own work has shown that filter-feeding mussels will consume tiny plastic particles, which then enter the animals’ bloodstreams and even their cells. If the same thing happens in nature, the plastic fibers could “end up on our dinner plates,” incorporated into seafood, Browne warns. There is still no direct evidence that the fibers—pollutant-tainted or otherwise—harm marine life, but Browne says it’s worth figuring out. He argues that the fibers are “guilty until proven innocent” and says that textile and washing machine manufacturers, as well as sewage treatment plants, should be looking for ways to keep the fibers out of the ocean. Garments that shed less lint, or filters that trap the fibers, might help. ScienceNOW sent a copy of the study to Patagonia, one popular maker of fleece sweaters. No one was able to review the study and comment before deadline, but spokesperson Jess Clayton said that Patagonia does intend to follow up on the findings with Polartec, its primary supplier of fleece. EPA Plans to Issue Rules for Fracking Wastewater: Scientific American. The EPA took another step toward tightening oversight of hydraulic fracturing today, announcing it would initiate a process to set national rules for treating wastewater discharged from gas drilling operations. Until now, the agency has largely left it to states to police wastewater discharges. Some have allowed drillers to pump waste through sewage treatment plants that aren’t equipped to remove many of the contaminants, leading to pollution in some rivers and to problems at drinking water facilities. Cynthia Dougherty, EPA’s director of ground water and drinking water, told a Senate panel today that the agency has an important role to play in bolstering state standards. When drillers frack a gas well, they inject thousands of gallons of chemicals, some of which are highly toxic even at low concentrations. When the fluid comes back up, it carries extremely salty water that can contain heavy metals and radioactive elements. In Western states, most drilling wastewater is injected deep underground for permanent storage. There are fewer injection wells in the East, however, so much of the waste from drilling in the Marcellus Shale? was initially discharged into surface waters. For years, Pennsylvania allowed growing volumes of wastewater to flow into the state’s rivers. As ProPublica reported two years ago, the water’s high salt and mineral content was believed to have elevated pollutant levels in some streams. It also may have clogged industrial equipment, killed fish and caused contamination in drinking water. In March, the EPA sent a letter to environmental officials in Pennsylvania expressing alarm at high pollutant levels in the wastewater that was being discharged into the state’s waterways. The agency urged the state to increase monitoring. The next month, the state asked drillers to stop discharging waste unless it was properly treated. By June, state officials said that no waste was being discharged without full treatment. In an email to ProPublica, the EPA said that concerns about releases in Pennsylvania and “other information” led the agency to initiate the process to set new national rules. The agency said about 22 billion gallons of wastewater from coalbed methane drilling go into surface waters across the country each year. The EPA does not have data on how much shale gas wastewater is being discharged nationwide. The Independent Petroleum Association of America issued a statement today saying it would work with the EPA to develop new standards and noted that drillers are increasingly cleaning and reusing their wastewater. Officials in Pennsylvania and at the EPA have said that increased recycling has been an important factor in reducing wastewater discharges. The EPA said it would propose wastewater rules for coalbed methane drilling in 2013. Similar rules covering shale gas will come a year later, after the agency gathers more data on discharges. The plan is one of several recent moves to increase federal oversight of fracking. Earlier this year, the EPA proposed rules that would limit air emissions from fracking operations. The Interior Department?, which regulates drilling on federal lands, has said it will issue rules covering fracking within the month. All of this drilling from wells and mines that is causing the waste water pollution should be shut down and not allowed to continue and no new permits issued until the EPA has these rules in place. It doesn’t make sense to wait a hundred years before regulating these dangerous polluting companies. Them dragging their heels as long as they have have cost many lives and ego systems. A job is not worth that many human and animal lives or endangering human health. They can wait until the EPA has these rules in place and when these companies disregard these rules, like they do in West Virginia, there should be at least a $50 to $100 million dollar fine or every rule they break or disreguard. I bet they will follow the rules then. The EPA will be extinct shortly. The current congress has made it a mission to destroy the EPA and any other regulatory commission in place and because they hold the purse strings it will happen either overtly or covertly by simply not funding it. Meanwhile Republicans shed crocodile tears over the long overdue reduction of NASA which might actually cause jobs and allow for new and creative manufacturing in both vacuum and microgravity environments not to mention a possible venture in sharing space with the public. A lot of that will depend on us getting off our butts and start to use Carbon for more than burning and that included CH4. Two Nobel prizes were awarded for graphene and now quasi-crystals have taken another one. What else is happening but very under the radar is the growth of nanotubes, diamond seeding (creating 2K diamonds from small seeds in high pressure carbon rich atmospheres) and the use of carbon composites as both metallic type materials and ceramics that are more malleable and yet harder than steel, titanium etc. There was an article in Dec 2010 describing the creation of H2 and O2 at rates of 3000 times the input and in a just in time type of production based on knowledge that was presented in 1993. What was new is that the process is on demand, prolific and sustainable. The upside is that both products burn and oxidizing H2 creates water as the waste product. Artificial leaves are being developed using Si which is interesting but again Carbon, Nitrogen, Oxygen, Iron and Sulfur are abundant, cheap and could create fuels that burn clean, materials that are lighter, conductive, semi-conductive and non-conductive with the current materials science we have developed using nano tubes and graphine. Will this get funded? Probably not because the political system is bought and paid for by big oil, pharmaceuticals, Wall Street and not by the people that are doing this research. There was some very interesting science being done by MIT where viruses were being custom tipped to create all kind of materials that had the above qualities and the only known use I have heard of to date was the military using them for batteries. We have real science that is in the works and in some cases mature but will the EPA and other regulatory sectors will be starved to allow the crap to continue. So excuse my pessimism, but I am trying to save enough quarters to buy a congressman. I know, David; it is a shame that we have all this science and the republicans are killing it all. You forgot to mention the nuclear auto that GM killed…GM is controlled by the republicans. That car could get over 300,000 miles on 8 grams of thorium. 100 or a 1,000 grams of thorium could power your house or business, probably, forever. There is great hopes for graphine batteries, but again it is being underfunded by the republicans. I have a whole jar of quarters if you want them. Maybe, just maybe we should stop relying on the federal government to fix locally fixable problems and elect civil SERVANTS who will actually do their jobs for the pay they receive. Companies need to do the same and are much more easily controlled and FORCED to do business correctly, morally, ethically and monetarily feasible. The EPA is in way over their heads and in need of being controlled to enforce rules and gers already in place. They are not here to take over price fixing and negotiating FOR unions so the Federal Government may covertly rule through back-door politics and smile while stealing your empowerment that can and will develop the new technologies for peace and prosperity belonging to the many, not the few legal thieves in corporate dominance and political back-door payoffs scandals. There are several problems with your line of reasoning. First, these shale fields extend over the area of several states. In order to compete with one another, states will face significant pressure to lower environmental standards. Second, the pollution caused by this practice, if allowed to continue in its current form, will continue to cross state lines as it contaminates entire river systems and watersheds. Finally, these fields, and the resources they contain, are arguably matters of national security as the represent large portion of our current reserves. Given these arguments alone, we’re faced with issues that are clearly in the federal domain. America has a big problem. Republicans refuse to acknowledge the environmental, and especially climatic damage done by US industries. They are just plain lazy and egoistical, expecting that God will take the necessary measures in their place. God only helps those that helps themselves, not those that help themselves to other people’s ressources…. It may well result in UN embargos on american exports….The world will not clear up the mess in their place! What about requiring all U.S. Senators and Congressmen to pass a basic, high-school level science exam before they can take their oath of office. They can pick their science: biology, chemistry, physics, geology. Doesn’t really matter. We don’t need them all to be scientists. Just familiar with the scientific method. NZ oil spill ship’s safety breaches. A CARGO ship spewing oil, shipping containers and rubbish along the New Zealand coastline after it hit a reef was detained in Fremantle in July for safety and cargo breaches and given three months to repair its ”safety management system”. The Liberian-flagged MV Rena was inspected again in Sydney on September 22, but the safety management system was not checked because the three months had not expired. It was allowed to sail on to New Zealand. The MV Rena was detained in Fremantle on July 21 by the Australian Maritime Safety Authority because of problems with hatch covers and cargo storage and its safety management system. A spokesman for the authority said ”two minor defects related to equipment were given two weeks for rectification and these were subsequently verified as completed”. The third defect with the safety management system was given three months to fix. ”No defects were related to charts, passage planning, navigation equipment or fatigue,” the spokesman said. A safety management system means a structured and documented system enabling ship personnel to implement effectively the ”company and ship safety and environmental protection policy”. The ill-fated Rena visited Melbourne on September 19 before heading on to Port Botany on September 22. Port of Melbourne spokesman Peter Harry said the port considered events such as the Rena incident as a ”high consequence, low probability” event for Port Phillip Bay and worked to minimise the probability. Peter Corcoran, director maritime safety with Transport Safety Victoria, said ”the mandatory use of pilots for large vessels entering the ports of Melbourne, Geelong, Hastings and Portland is one of Victoria’s key risk controls”. Phillip Starkins, from the Department of Transport, said the department ”owns, stores and maintains specialised pollution response equipment throughout the state to utilise in the event of an incident”. A German shipping company was ordered to pay more than $1 million in fines in 2005 after one of its vessels discharged 30,000 to 40,000 litres of waste oil sludge about nine nautical miles off Phillip Island in 2003. Disc Spins Its Way to $1 Million Oil Spill Clean Up Prize: Scientific American Podcast. When oil started spewing from BP’s Macondo well in April 2010, there weren’t too many options for cleaning it up. Concentrated slicks on the ocean surface could be set ablaze. Booms kept oil off the shores, as long as the waves stayed calm. And chemical dispersants of unknown toxicity could be sprayed to break up oil patches. But thanks to the Wendy Schmidt X Prize that won’t be true next time. A company from Illinois known as Elastec / American Marine won the $1 million first prize by tripling previous clean up rates. Over 10 weeks this summer, 10 finalists out of 350 entrants demonstrated their technology at the largest outdoor saltwater wave test facility in North America. Elastec’s Grooved Disc Skimmer scooped up 4,670 gallons of oil per minute and didn’t leave much behind. The machine looks like a giant, thick, grooved vinyl record spinning at high speed to capture nearly 90 percent of the oil on the waters. And there’s no shortage of oil spills for it to work on. 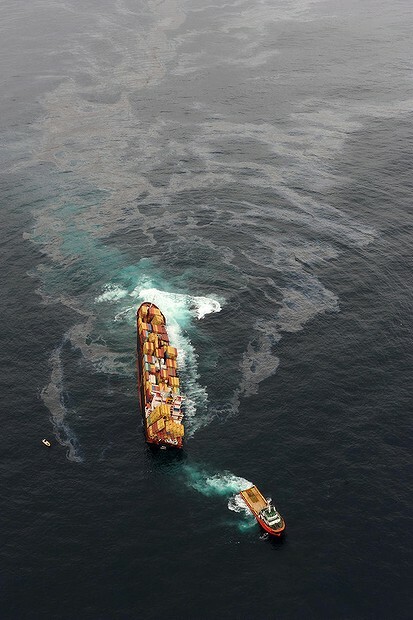 The latest is underway in New Zealand, as a stranded cargo ship leaks heavy oil onto a coral reef and local beaches. Is It Safe to Drink? The Problem with the Nation’s Drinking Water Standards: Scientific American. Among other things, the GAO report says, the EPA relies on flawed data. To determine the level of a particular pollutant in drinking water—which the EPA does before making a regulatory ruling on it—the agency relies on analytic testing methods so insensitive that they cannot identify the contaminants at levels expected to cause health effects. In addition, since 1996 the EPA has been required to make regulatory decisions about five new pollutants each year, ruling on those that might pose the biggest threats to public health. The GAO report asserts that the agency has been ruling only on the “low-hanging fruit”—contaminants for which regulatory decisions are easy rather than those that might be the most dangerous. “They’re not actually doing anything to protect public health,” says Mae Wu, an attorney at the Natural Resources Defense Council. For its part, the EPA has pledged to review the nation’s drinking-water standards and to add at least 16 new contaminants to the list of those it regulates. This past February the agency reversed a long-standing decision to not regulate the rocket-fuel ingredient perchlorate, making the chemical the first new drinking-water contaminant to be regulated since 1996. In its response to the GAO, the EPA stated that “no action” was necessary to better prioritize the contaminants on which the agency will rule in the future, nor did it acknowledge the need for improvements in data collection. The agency did, however, agree to consider improving its methods for alerting the public when there are drinking-water advisories. Federal Committee: Shale Gas Needs More Openness, Better Data – ScienceInsider. The subcommittee to the secretary’s Energy Advisory Board was not asked who should be regulating shale gas, Zoback says. Regulation now lies primarily with the states. But “we’re pointing out what can and should be done.” To regain public trust, the report says, much information about shale gas should become readily available to the public, starting with the chemical recipes for the fluids pumped at high pressure into shale to free up the gas. Those fluids sometimes spill onto the surface and into waterways. And much more information should be gathered on the environment before, during, and after drilling. 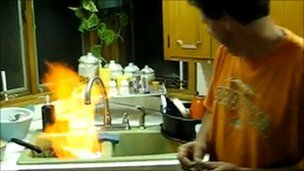 The debate over whether and how drilling and fracking contaminate groundwater with gas—the infamous flaming water faucet of the documentary Gasland—would benefit especially. “We feel very strongly that having good data will advance a lot of the issues,” Zoback says. Some sort of national organization focused on shale gas should also be formed, the report says. It could create a national database of all public information as well as disseminate best practices to industry as they evolve. Added support for existing mechanisms that aid communication among state and federal regulators would also help. Where did the Gulf’s spilt oil and gas go? – environment – 18 July 2011 – New Scientist. Oil is composed of many thousands of different chemicals but the plume that stretched through the Gulf contained relatively few. Now chemists have worked out what happened to the rest. Christopher Reddy, an environmental chemist at the Woods Hole Oceanographic Institution in Massachusetts, and colleagues, used a remotely operated submarine to collect samples directly from the leaking well in June 2010 and compared these with samples taken from elsewhere in the oil plume. Reddy likens the oil and gas molecules gushing out of the wellhead to passengers on an elevator. “We wanted to know which compounds got off the elevator instead of going up,” he says. The team found that water-soluble compounds dissolved in neutrally buoyant seawater about 400 metres above the wellhead. These included benzene, toluene, ethylbenzene and xylene – a toxic suite collectively referred to as BTEX. And in this layer they stayed. By contrast, the compounds that reached the surface were mainly insoluble. Reddy’s work helps to answer one of the major questions from the oil spill – what happened to all that oil and gas, says David Valentine, a microbial geochemist at the University of California, Santa Barbara. The results show how deep oil spills differ from surface spills, where many toxic compounds quickly evaporate rather than contaminating the water. The team’s measurements also show that BTEX concentrations reached up to 78 micrograms per litre. That level is several orders of magnitude higher than known toxicity levels for marine organisms, according to Judith McDowell, a zoologist also at Woods Hole. 'Super sand' to clean up dirty drinking water? BBC News – ‘Super sand’ to help clean up dirty drinking water. Contaminated water can be cleaned much more effectively using a novel, cheap material, say researchers. Dubbed “super sand”, it could become a low-cost way to purify water in the developing world. The technology involves coating grains of sand in an oxide of a widely available material called graphite – commonly used as lead in pencils. The team describes the work in the American Chemical Society journal Applied Materials and Interfaces. 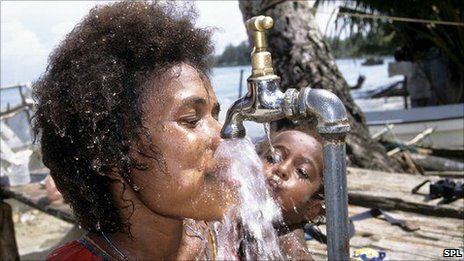 In many countries around the world, access to clean drinking water and sanitation facilities is still limited. The graphite-coated sand grains might be a solution – especially as people have already used sand to purify water since ancient times. But with ordinary sand, filtering techniques can be tricky. 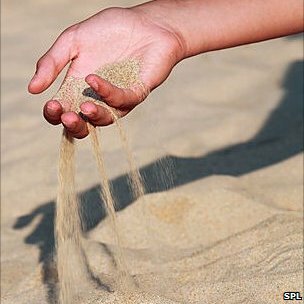 Wei Gao from Rice university in Texas, US, told BBC News that regular coarse sand was a lot less effective than fine sand when water was contaminated with pathogens, organic contaminants and heavy metal ions. While fine sand is slightly better, water drains through it very slowly. “Our product combines coarse sand with functional carbon material that could offer higher retention for those pollutants, and at the same time gives good throughput,” explained the researcher. She said that the technique the team has developed to make the sand involves dispersing graphite oxide into water and mixing it with regular sand. The lead scientist of the study, Professor Pulickel Ajayan, said it was possible to modify the graphite oxide in order to make it more selective and sensitive to certain pollutants – such as organic contaminants or specific metals in dirty water. Another team member, Dr Mainak Majumder from Monash University in Melbourne, Australia, said it had another advantage – it was cheap. “This material demonstrates comparable performance to some commercially available activated carbon materials,” he said. He pointed out that in Australia many mining companies extract graphite and they produce a lot of graphite-rich waste. “This waste can be harnessed for water purification,” he said. BBC News – Shale gas drilling ‘contaminates drinking water’. Shale gas drilling operations increase the risk of nearby drinking water becoming contaminated with methane, a study has suggested. Researchers found, on average, methane concentrations 17 times above normal in samples taken near drilling sites. Growing demand for energy has led to a sharp increase in shale gas extraction around the globe, prompting concerns about the impact of the technology. “We found surprising levels of methane in home-owners’ wells that were close to natural gas wells, ” co-author Rob Jackson, Nicholas Professor of Global Change at Duke University, North Carolina, explained. “We found that within a kilometre of an active gas well, you were much more likely to have high methane concentrations,” he told BBC News. The team from Duke University collected samples from 68 private water wells in the north-eastern states of Pennsylvania and New York. “We found some extremely high concentrations of methane: 64 milligrams of methane per litre of drinking water, compared with a normal level of one milligram or lower,” Professor Jackson observed. Videos are available on the web that appear to show people setting fire to water pouring out of a tap, and Professor Jackson said that he had witnessed such an spectacle himself. He agreed that the main concern at present was not from drinking the water, but from the risk of an explosion. However, he added that the team were calling for a medical review of chronic, low-level exposure to methane. “I could not find any peer reviewed literature on the health effects of low level methane on people,” He observed. Professor Jackson said that the simplest explanation of how the gas ended up in people’s water supplies was down to “leaky gas well casings”. “If there are cracks or imperfections in the gas well, especially in the vertical section nearer the surface, then methane and possibly fracking fluid/waters,” he said. “That is the simplest and most likely explanation. Professor Jackson was keen to point out that the study’s drinking water samples revealed no evidence of contamination from fracking fluids, of which about five million gallons are used to unlock the gas in each well. As well as the PNAS study, the team has also published a paper outlining a number of research recommendations, highlighting areas they feel needs to be done in order to gain a stronger scientific insight into the impact of the technique. In the UK, MPs are expected to publish a report shortly that considers the impact of shale gas extraction and what role it can play in terms of delivering future energy security. The Energy and Climate Change Select Committee inquiry will also assess what are the risks and hazards associated with drilling for shale gas? The combination of rising energy prices and concern about future energy supplies has seen the technology being embraced by nations around the globe. “Ten years ago, people did not really know about this source of gas,” said Professor Jackson. “The boom in the United States started in the Barnett Shale (found in Texas, and considered to be the largest onshore gas reserve in the US) and it has only been in recent years that we have realised how much gas is out there and economically available. Swift water hinders Yellowstone River oil spill cleanup – CNN.com. 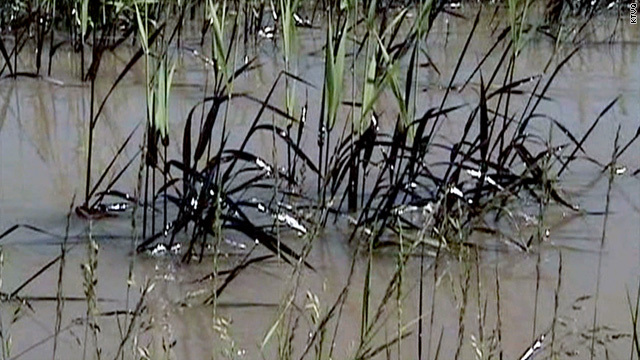 The leaked oil floats in pools caused by recent flooding around the Yellowstone River. 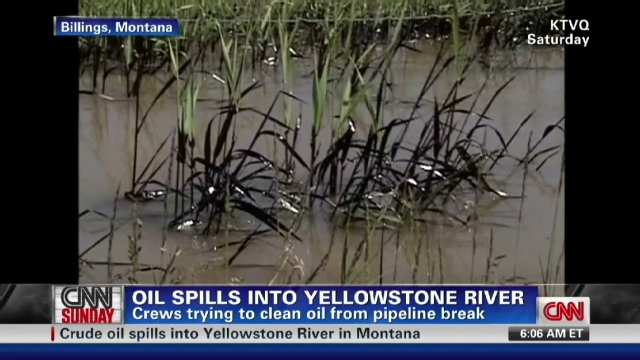 (CNN) — High water and a swift current has helped break up an oil spill that dumped hundreds of barrels of crude into Montana’s Yellowstone River over the weekend, local officials said Sunday. ExxonMobil said between 750 to 1,000 barrels (32,000 to 42,000 gallons) of oil escaped late Friday when a pipeline ruptured beneath the river near Billings. Some of the of the oil has washed ashore or formed pools of “milky brown” residue in river eddies, Yellowstone County Sheriff Mike Linder said. But Linder and Duane Winslow, the county’s emergency services director, said flooding has made it harder to track and clean up the mess. The Yellowstone was running above flood stage over the weekend, sweeping brush and logs into the river, and had a 5- to 7-mph current Sunday. The spill was discovered late Friday night near Laurel, west of Billings and about 100 miles downstream from Yellowstone National Park. The pipeline feeds an ExxonMobil refinery in Billings, and the company said it had shut down the line within minutes. “We will stay with the cleanup until it is complete, and we sincerely apologize to the people of Montana for any inconvenience the incident is creating,” Gary Pruessing, the president of ExxonMobil’s pipeline subsidiary, said in a statement issued Sunday. There were no reports of wildlife being endangered by the spill, Tim Thennis, who is leading the response for the Montana’s Disaster Emergency Services agency, said Sunday. The spill forced the evacuation of more than 200 nearby residents after it was discovered Friday night, but they were allowed to return Saturday morning. Laurel rancher Lloyd Webber said the spill left a “pretty heavy” smell of oil hanging over the area Friday night as he and his wife left their home. “We went to the Perkins in Billings and drank coffee for two or three hours, then went back,” said Webber, who lives about a half-mile from the river. The Yellowstone is one of the tributaries of the Missouri River, which it joins in neighboring North Dakota. Thennis said state agencies, the federal Environmental Protection Agency and ExxonMobil are working together to clean up the spill.